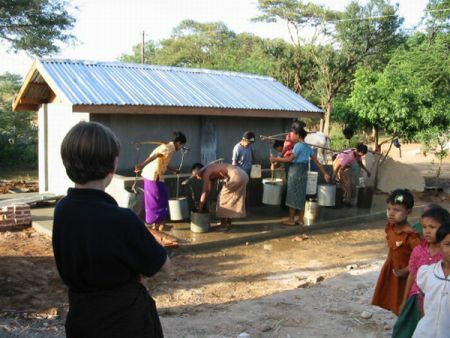 In May 2003, in Thu-Htay-Kan, a village near Bagan, Burma, Generosity in Action donations funded a 300-foot deep well. The 1,600 people in the village had previously obtained their water by walking down to a river and bringing it back in buckets. This project, the largest in scope taken on to date, developed from the interest of travelers, faculty, the local tour operator and the U.S.-based tour operator to support the people of Burma directly. After the initial construction, later travelers visited the village and made suggestions for improvements. Subsequent funding allowed for the water supply to be extended to two addtional locations within the village. To date Generosity in Action has invested $5,700 in the community, thanks to the generosity of over 25 individual donations. On November 6, 2004, forty participants on a travel/study seminar visited Thu-Htay-Kan village. 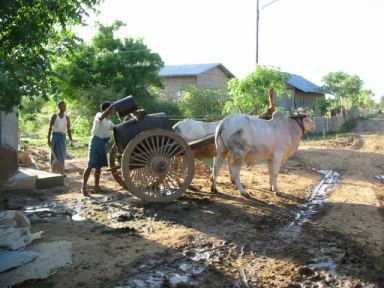 The villagers were making constant use of their new diesel-powered well. Three sides of the cement well building proudly displayed the Stanford block "S", reflecting the generosity of previous travelers from Stanford Alumni Association who visited this village. Bullock carts with water kegs took turns in the water line with women balancing poles that carried water containers on each end. A new diesel engine pumped water to grateful, hard-working villagers. Ample water supplies have created hope for increased prosperity in a formerly desolate village. In 1990, the Government of Burma had relocated the residents of the Pagan Archeological Zone into new villages south of Pagan. But the government had not created adequate infrastructure in the new, relatively arid villages, which are sited in a rain shadow. The new well has filled a critically important need. Thu-Htay-Kan residents have benefited from less drudgery in hauling water. They also have shifted their farming practices to water-using activities that provide better diets and cash incomes. They grow vegetables for home consumption and for sale in a nearby village, and they produce fodder for goats and earn income from selling goat meat and milk. Since the well began operating last year, more than thirty families have decided to keep goat herds with at least thirty animals each. One well thus has made a huge difference for these appreciative people. The village reported damage to the pump due to low electrical power. Initially we expected to have to reinstate the generator but fortunatley the power problems were resolved. The village also reported that the connector pipe to the second serving station had been damaged but hopefully it can be repaired with funds generated from the sale of water to other villages. In the spring of 2008 another group visted the village.For photos from the 2008 visit click here. See additional photos taken in 2002 when travelers visited and a more recent visit in 2004. Latest pictures from the third well project and the new school building - June 2004.